Hail damage means big business for many body shops and towing companies. Bill Paul, of Bill Paul's Towing, said he has been working from 4 a.m. until 7 p.m. He said calls came in as Tuesday's storms hit. "The insurance companies are telling me the phone calls are still coming," he said. "They haven't quit, so there is no telling how many there will be." Jim Patel's Autotech in Irving also has continuous calls about vehicles heavily damaged by hail. 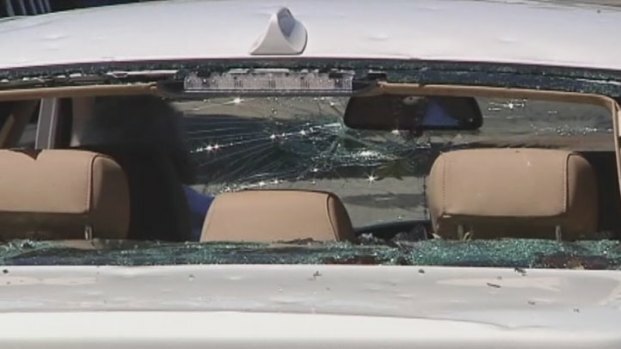 Car repair shops in Irving are seeing dozens of cars with significant hail damage after Tuesday's severe weather. Bill Paul's towing company has been busy and Jim Patel says Autotech is waiting for insurance adjusters as hail victim Katrina Winn waits for repairs. "Right now, we're actually collecting all the cars in and then we're waiting for insurance agents to come out or the adjusters to come out and look at them," Patel said. Patel said a car with dents all over the body and broken sunroofs and windows could cost in the area of $8,000 to fix. In some cases, insurance companies could consider the vehicles a total loss because the repairs would cost more than the value of the car, he said. Patel said he expected about 20 hail-damaged vehicles to come into his shop Thursday. Because of the high volume of cars and the number of repairs most need, Patel is fixing the most important thing first and recommending that customers finish the other repairs at a later time. "Most of the cars that are coming in, we're just replacing the windshields on them first to make the cars drivable," he said. Katrina Winn, an Irving resident whose car was damaged by hail, is one step ahead. She already fixed her windows and is hoping the rest won't be too costly. "I'm hoping that it'll be pretty good," she said. "I can get back on the road and back to work and do what I got to do."